London Heathrow Airport - LHR serving over 75 million passengers per year (more than the entire UK population) is the busiest airport in Europe and third busiest worldwide, after Atlanta and Beijing. As a major gateway United Kingdom and to its capital, it is also a convenient car hire location: the proximity of major roads in the airport’s area allows quick access to London as well as to other parts of the UK and the steep competition between many car rental providers often makes it possible to find fairly cheap car hire deals. VW Polo is one of the most popular models in economy class. Designed to accommodate up to 55 million passengers, the airport underwent several expansion operations. The state-of-the-art Terminal 5 inaugurated in 2008 increased the airport’s capacity to 90 million. In 2017, the number of passengers served by the largest European airport reached 7.8 million. Heathrow Airport connects London to all continents. Over 80% of all operations at the airport are long haul flights being London-New York the busiest single destination operated at LHR. Edinburgh, Glasgow-International and Manchester are the most popular domestic routes. The busiest London airport scores high in rankings for the world’s best airports. It occupied the 8th position on 2018 edition of Skytrax World Airport Awards based on the opinion of over 13.7 million travellers from 100 different nationalities. The airport continuously implements modern technological solutions. In 2018 it completed trials for the first autonomous (self-driven) airside vehicle. The so called CargoPod, a fully automated vehicle, was tested for feasibility and potential at first for cargo operations. This pioneering study could contribute to the use of autonomous vehicles, within a wide range of purposes, on airports across the world. Of all six airports serving London (together with Gatwick, Luton, Stansted, London City and Southend) Heathrow and London City are the only airports located within the area of Greater London (and within a fairly short distance to the centre of the British capital. See location of London airports on the map. (This map includes also airports of Oxford and Lydd). The main London airport is situated in the south of Hillingdon Borough, west of London city centre, between the towns/built up areas of Harlington, Cranford, Hatton, Stanwell and Longford. The distance to Central London is approx. 14 miles via M4 motorway which passes along the northern edge of the airport grounds and continues later as A4 directly into the city centre. London ring road – M25 just west of the airport allows an easy access from LHR to different areas of Greater London, as well as to other London airports. Travellers requiring a hire car upon their arrival to the airport will find a vast choice of car rental deals, often at very competitive prices, through internet search engines of car hire, such as Cartrawler. This easy to operate and efficient tool allows to compare prices from major car rental providers in a given location and to carry a simple and safe online booking. Cartrawler displays offers from many Heathrow Airport car hire providers, amongst them: Avis Rent A Car, Alamo, Europcar, Hertz, National, Alamo, Budget, Enterprise, Sixt Car Rental and Green Motion. The cheapest hire London cars are often provided by the low-cost car hire companies such as Flizzr, Keddy by Europcar, Easirent and Interrent. Few airports in the UK have a better choice of cars for hire than this one. The most utilitarian compact class car may be a Hyndai i30, but if you want to be seen in a slightly more upmarket vehicle, for about the same price, Heathrow Airport rental car companies frequently offer vehicles like the fashionable Mini Countryman at a very modest additional pay when booking online in advance. Even the environmentally friendly Green Motion car rental company will have 'specials' in their offerings. For the cheapest run-about rent-a-car, nothing beats Fiat 500, which almost all the major car rental companies in LHR Airport will have in the fleet. 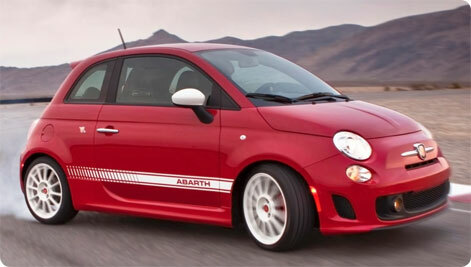 Fiat 500 is the most popular minicar for rent in the London area. In general, you do not save much by going small when it comes to rental cars in this London airport. Even a fairly large VW Golf estate car (or similar) will hardly be much more expensive than the cheapest Hyundai i10 city car for rent. For larger cars, consider the VW Passat which is cheap to rent in LHR. A bit more pricey, the BMW 3-Series and Mercedes C-Class in the small-to-midsize prestige rental class still both offer good value for money when booking car hire in at London Airport. People carriers like the VW Sharan or Ford Galaxy are amongst the more expensive cars to rent, but from time to time, a weekly rate below £150 is available even for those large 7,8 or 9 passenger MPV/minivan rental cars. When 9 seats (including driver) are needed, most companies with cars for hire will define the vehicle as a minibus. Minibus rental from LHR is, frequently, a Mercedes V-Class 9-seater (or 8-seater) and it will virtually always be equipped with a diesel engine for cheap and effortless motoring. If you choose one of the popular 5+2 MPV people carrier rental cars in Heathrow Airport, be aware that some models, such as VW Touran, Vauxhall Zafira, Citroen C4 Picasso or Peugeot 5008 will have very limited luggage space with all seven seats in use. For the full size MPV (with room for luggage and 7 people), we recommend the full-size 7-seaters: Renault Espace, VW Sharan, Seat Alhambra or Ford S-Max/Ford Galaxy MPV cars. Other cars available include specials like the Range Rover Sport, various cabriolet rental cars (usually only in summer), pick-up rental cars and white commercial vans in different sizes. Europe’s busiest airport is also one of the largest in terms of area. It consists of five terminals, denominated as Terminal 1, 2, 3, 4 and 5. An additional, small terminal closed to general public is reserved for the most important visitors to the British capital: heads of states and royalty, hence the name “Royal Suite”. One of the oldest terminals at LHR,Terminal 1 was inaugurated by Queen Elizabeth II in 1969 and closed in 2015. Out-dated and overcrowded, it became obsolete as the newer and modern terminals of the main UK airport were built. LHR Terminal 2 in its present form was inaugurated in 2014, having replaced the airport’s oldest structure, dating back to 1955 (originally known as Europa Building and later, as Terminal2). The new, modern Terminal 2, officially referred to as Queen’s Terminal serves all Star Alliance members (amongst them Air Canada, Aegean Airlines, Lufthansa, Scandinavian Airlines, Turkish Airlines, United Airlines and more), as well as Aer Lingus, Germanwings and Little Red (domestic operations of Virgin Atlantic). Car rental desks at LRH Terminal 2 are located of the arrivals hall on Level 1 - see map. Refurbished and expanded on several occasions since its inauguration in 1961, Terminal 3 of LHR currently serves around 20 million passengers, mostly on long-haul flights to North and South Americas and Asia. Amongst airlines using Terminal 3 are: British Airways, Delta Airlines, Emirates, Qantas, Royal Jordanian, US Airways, Virgin Atlantic, as well as a few carriers operating European routes, for example Finnair and Vueling. Virgin Atlantic airline has at Terminal 3 a dedicated check-in area for its passengers, known as Zone A. 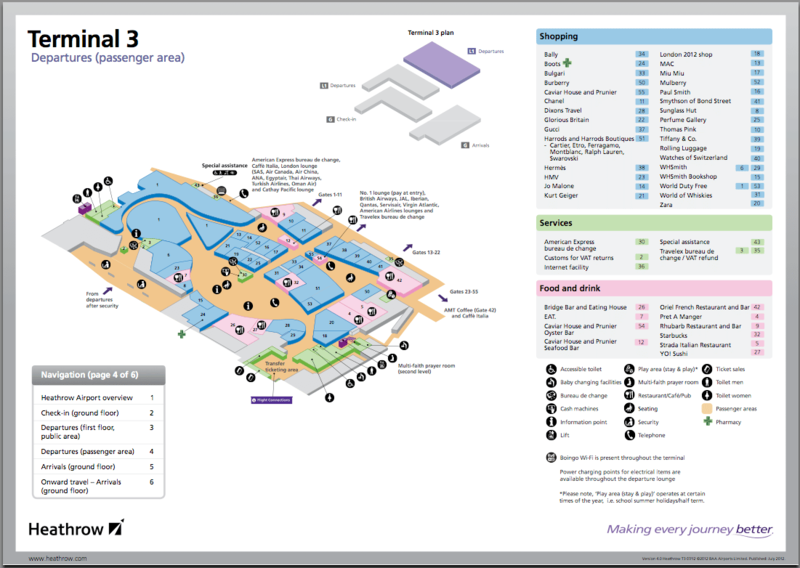 The counters of LHR Terminal 3 car hire companies are located in the arrivals hall on the ground level (close to the smoking area/couch waiting lounge) – see map. Inaugurated in the mid-eighties and redeveloped afterwards, Terminal 4 of LHR is used by the airlines from the Sky Team alliance, such as KLM, Delta Airlines and Tarom, as well as other carriers, amongst them Air India, Royal Air Maroc and Royal Brunei. LHR Terminal 4 car rental desks can be found in arrivals hall on the ground floor - see map. Serving approx. 30 million passengers per year, Terminal 5 is the largest terminal of the main London airport. Inaugurated in 2008, for several years it was serving exclusively British Airways. In 2012, after the merger of British Airways with Iberia (under the banner of International Airlines Group), Terminal 5 welcomed also operations of the Spanish flag carrier. The terminal consists of a main building - concourse A and two satellite buildings, denominated as concourses B and C, which are connected to the core of Terminal 5 by an underground people mover. LHR Terminal 5 car rental desks are located in the arrivals hall (ground level) near the information desks – view map. 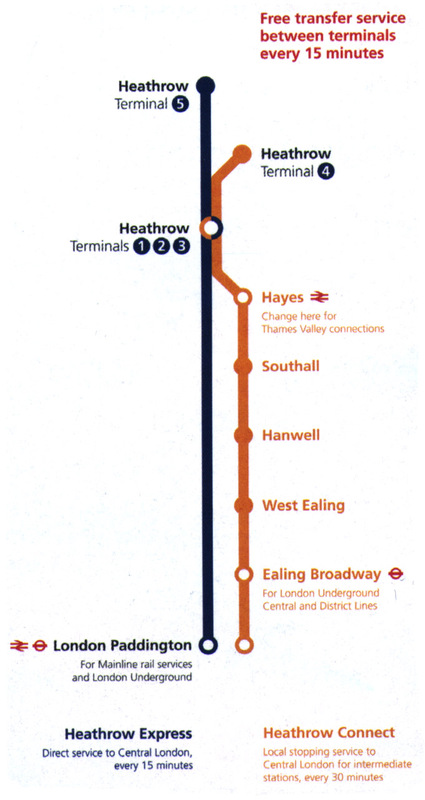 LHR Terminals 1, 2 and 3 are situated within a short distance from each other. It is possible to walk between them (up to 10 minute walk). 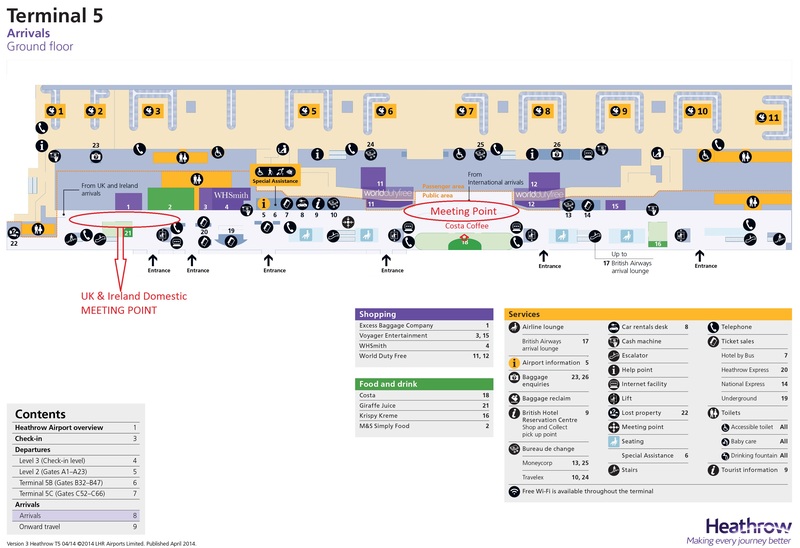 In order to transfer to Terminals 4 and 5, passengers at Heathrow Airport can use Heathrow Express or Heathrow Connect trains (free of charge to connect between the terminals), London underground or airport busses. Ultra Personal Rapid Transport, available at Heathrow Airport since 2011 is an innovative transportation system connecting Terminal 5 with the business car park. It consists of small automated transportation pods with capacity for 6 people (four adults and two children) and luggage. The self-serviced pods are battery powered which allows to reduce significantly carbon emissions at the airport. The airport authorities stipulate that the connection time between the terminals situated the furthest apart does not exceed 20 minutes. Given the large dimensions of the airport, however, it is recommendable to always allow extra time when transferring between LHR terminals. Up dated flight information is available on the monitors. Please, remember to check-in in due time (3 hours prior to departure for long-haul flights, 2 hours prior to departure for European flights and 90 minutes prior to departure for domestic flights). Travellers who did not opt for car hire, can choose from a variety of public transportation means available at all terminals of the airport. One of the most convenient and fastest ways of traveling between Heathrow Airport and London city centre is by train. The combined Heathrow Express and Heathrow Connect link the airport to London Paddington Station. Please note that while both services follow the same route, Heathrow Express is a direct, non-stop service, while Heathrow Connect has several stops before reaching London city centre. See map of Heathrow Connect stations. Travel time on Heathrow Connect between the airport and Paddington station is approx. 26 minutes. The direct Heathrow Express takes around 15 minutes to arrive to Paddington Station. The airport is served by London underground Piccadilly line – see London tube map. 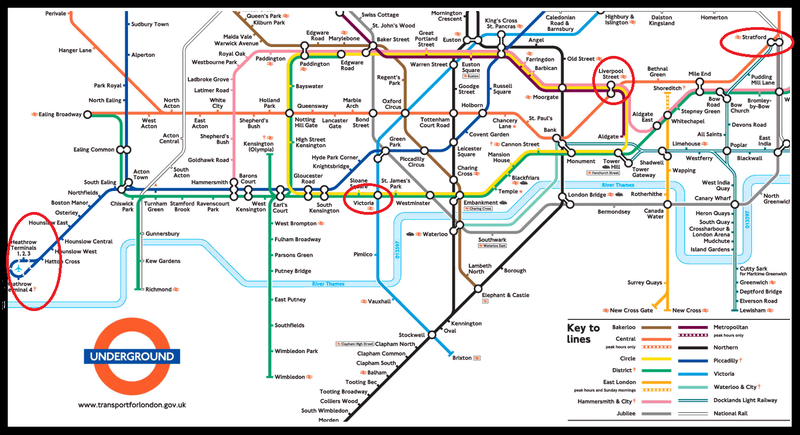 All terminals of LHR provide access to London underground: terminals 1, 2 and 3 share the same station, located in the central area between terminal buildings, while terminals 4 and 5 have each an separate station, located underground. Travel time between the airport and the city centre on London tube is approximately an hour. National Express is amongst the most popular bus services available at the airport. It provides convenient links to London city centre (Victoria Station) and to other London airports, as well as to different cities in England. Cheap car hire London Airport. Get quotes from major LHR Airport car rental companies: Avis Rent A Car, Alamo, Europcar, Hertz, National, Sixt Car Rental, Alamo, Budget, Enterprise, Green Motion, Easient and Interrent. Minivan rental LHR Terminal 5 British Airways. Heathrow to London Connect stations.